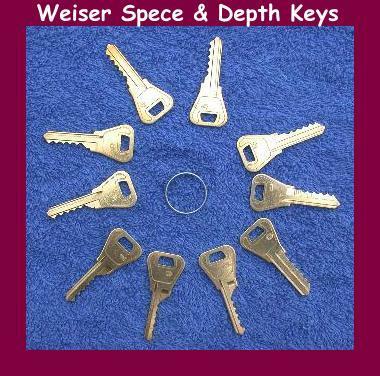 Ever see a key or a lock with a number stamped on it like FS332, FA5212, or 61543? Those are called key codes. They tell those who know how exactly how to cut a key to fit the lock, without ever having to see the lock or an original key themselves. Number and or letters that are on the cylinder, (where the key goes in). Examples: 1X010, C66A, 010. Direct digit codes. Each digit corresponds to each cut on the key. The value of each digit tell how deep to make the cut. Some old American and some foreign keys are direct digit. These codes have the same number of digits as there are cuts in the blade of the key. Interpreted code. For these mathematical tricks are used (for example you must subtract 124 from the code), then you end up with the direct digit code above. On these you’ve got to know the method of interpreting the code for that key. Mostly people just look it up in a reference book. Code Book. The code provided is just an index that points to an entry in the book. The entry lists the numbers for the cuts that need to be made, as in the direct digit code. 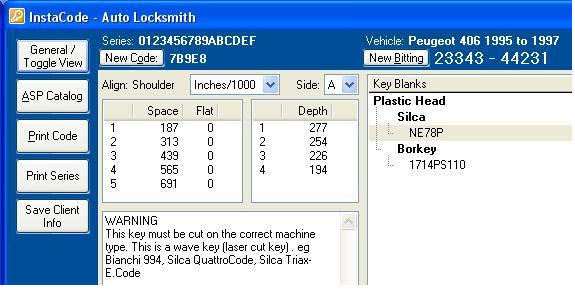 There are hundreds of different key codes in use just for automobiles. Once you’ve interpreted the code, there’s still the matter of how you use it. This requires a guide to the depth and spacing of the cuts to be made in the blade of the key. There are key cutters that you just set for your key type and cut to the numbers, but there are so many types of keys available, even for cars, that it’s not practical (and may not be possible) to have a setup for every key made. Then you need to use a depth and space guide. This gives the depth of the cut to be made for each depth number, and the spacing between cuts. Each code has a depth & space guide, although many codes share the same guide. Finding the code can be a chore. Sometimes it’s printed on the keys, sometimes on the lock, sometimes it’s not on the vehicle at all. Sometimes it’s in the owner’s manual or on other documents that would have been provided to the original owner. Keep in mind that keys often have other numbers besides codes on them, locks have part numbers on them that have nothing to do with the code, and just because someone wrote a number down in the manual doesn’t mean it’s the key code. Check with us before ordering a key cut to a code! Fully half the people who don’t enter something not even resembling the key code. For some vehicles the code can be obtained from a dealer or the manufacturer. For instance, for many classic British cars (except Jaguar), the British Motor Heritage Trust can research your vehicle and issue a build certificate that will usually have the key codes on it. Mercedes Benz owners can try the Mercedes Benz Classic Centre. There are many computer programmes that can give you a list of possible codes for any particular number. But from then on you need some experience to determine the key blank and code series, many of these will link to a computer driven key cutting machine and will produce a key to exact tolerances. Some locksmiths cut key to vehicles on these machine as standard so that every key is as good as an unused key. If you are at a customer’s premises then trying to determine the key blank or series is easier as you can look at the keyway and make a sketch.